Vic Hennegan carries something with him everywhere he goes. In his heart he keeps the entire Universe and with each album release he shares something of it with the rest of us. Nowhere before has so much of his interior life been displayed as on Nebula Waves (56'51"). This work reaches into a wordless spiritual realm and re-creates for us the world of light and sound in which Hennegan lives. Depicting a space where sound seems to abide as a force, the listener is drawn far from the experience of the everyday. Among this album's many mysterious sonic moments we find a robot choir singing its electronic hymn over a slowly pulsing sequencer run - while further in an arpeggio of synthesized notes dances through echo with Hennegan above it retaining his crown as king of the soaring synth lead. 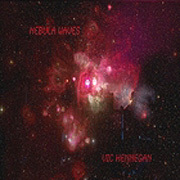 Nebula Waves feels less plotted and more genuinely lived - as to realize this music Hennegan draws on both his Spacemusic core and life ideals. Due to the personal nature of Nebula Waves listeners will not need an education in this genre of music to appreciate it, just an open state of mind.